My friend Philip Hawley Jr., a medical missionary, posted this and sent it to me. These are the kinds of people that give me great hope. They are the true heroes even though most will have never heard of them. 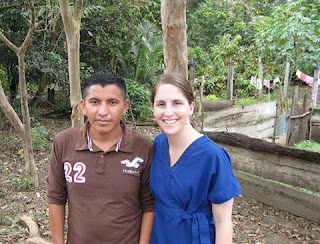 Mauricio, pictured here alongside my daughter Sara, was still a teenager when he left his village in the jungles of northern Guatemala to attend nursing school. Instead of using his education to earn a comfortable living in one of the larger Guatemalan cities, he returned to the remote region where he had grown up, because he wanted to work among the poor. Mauricio was murdered last night (probably a senseless killing by drug criminals) after a long day of caring for patients in the small town of Cruce Dos Aguadas, Guatemala. He was a quiet, humble, and holy man who lived in a ten-by-ten foot room with a concrete floor, a tin roof, and no plumbing. He radiated both humility and dignity, and in his company I always felt the presence of divine grace. When circumstances at a make-shift village clinic tested my patience, I had only to glance at him—his gentle smile always reassured and strengthened me. Please pray for Mauricio, his family, and those who murdered him. It's a sad day for all of us who knew this wonderful man, but I'm sure there's a big celebration going on in heaven.